Special Delivery, 1893, 10¢ orange, o.g., never hinged, Extremely Fine; with 2015 P.S.E. Graded certificate (XF 90, SMQ $1,750). 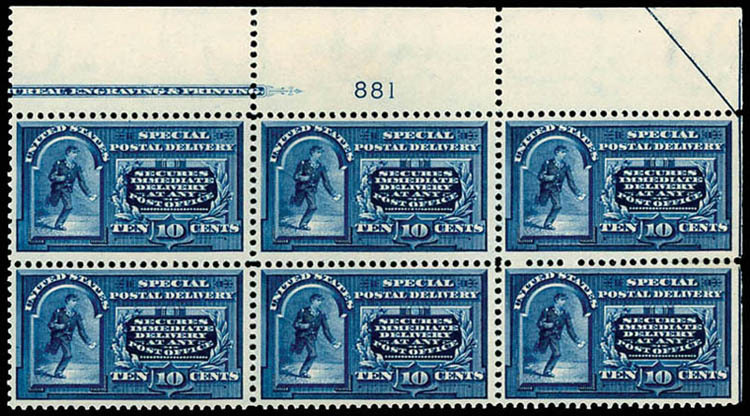 Special Delivery, 1895, 10¢ blue, top margin block of 6 with plate number, part imprint and guide arrow, o.g., never hinged, deep bold color, wide margins and very fresh, Very Fine, an attractive and scarce multiple. Scott No. E5 $3,000 for singles. Special Delivery, 1914, 10¢ ultramarine, top margin plate block of 6, o.g., never hinged, remarkably well centered amid large margins, exceptional fresh with bright vivid color, light crease in left selvage not detracting, otherwise Extremely Fine, a handsome and scarce plate block with top left stamps unusually choice; with 2015 P.F. certificate. 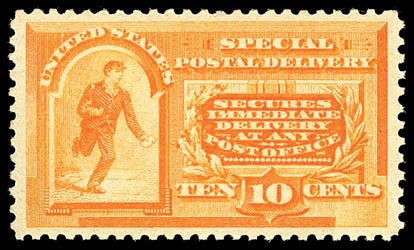 AN EXCEPTIONAL AND RARE NEVER HINGED PLATE BLOCK OF THE 1914 10¢ SPECIAL DELIVERY ISSUE. Special Delivery, 1916, 10¢ pale ultramarine, o.g., never hinged, Extremely Fine to Superb; with 2015 P.F. certificate for block and 2015 P.S.E. Graded certificate (XF-Sup 95; SMQ $1,675). 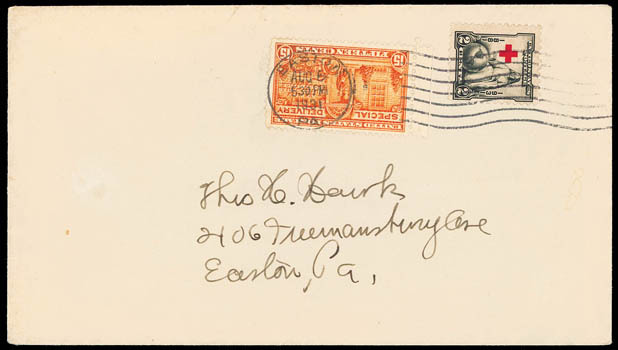 Special Delivery, 1931, 15¢ orange, left selvage single, used with 2¢ Red Cross (702), both tied by "Easton, Pa., Aug 6, 1931" machine cancel on cover addressed locally, reverse with notation "Aug 6th 1931, First day cover from Easton, Pa" on flap, Very Fine; with 2008 P.F. certificate. 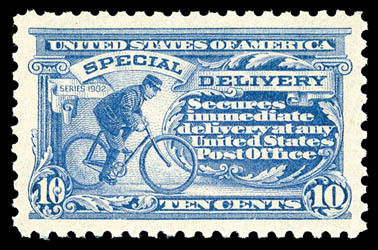 THIS IS THE EARLIEST DOCUMENTED USE OF THE 1931 15¢ SPECIAL DELIVERY ISSUE. The Scott catalog notes that the Washington D.C. Aug. 13, 1931 first day cover date reflects the first day of sale at the philatelic agency. The actual earliest documented use of E16 is Aug. 6, 1931 at Easton, Pa. We note another example used from Easton Pa. addressed to H.M. Southgate at Washington D.C. (ex-Aristocrats).